I would like to welcome author M. Lamontt Bowens. Stopping by with an author interview. Let's give him a warm welcome! I’m a native San Diegan. I was born and raised in San Diego, California. There aren’t many of us here anymore. I moved around the states some and spent my longest time outside of San Diego living in the bay area for 8 years before returning to my hometown where I reside now. I was raised by a single parent mother. I have six siblings but was only raised with four. I grew up poor in a very rough neighborhood in the Southeast and East San Diego sections of the city. I started running with a street gang at age 11 and became an active gang member and drug dealer by the time I was 16 years old. I was never a good student academically or with citizenship and ultimately dropped out of high school during my senior year. Two weeks after my nineteenth birthday I was sentenced to 5 years in federal prison. After I was released from prison when I was 23 years old, I was able to turn my life around, become a good parent and family man to five children and my wife at the time, start working at a law firm in its mailroom, put myself through college and law school at night, and become an attorney. I’m a very spiritual person and to stay spiritually, mentally, emotionally, and physically in shape, I maintain a strong relationship with my God while being an avid runner and eating a healthy diet though I fall short with the healthy eating some of the time. I’m also a proactive parent with my only child who is still a minor. Do you have a day job other than being a writer? And do you like it? Yes and Yes. I’m a full-time staff attorney for a national securities litigation law firm. Actually, the same law firm that gave me an opportunity to work in its mailroom seven months after being released from prison. Our primary focus is prosecuting private securities claims on behalf of shareholders. It’s challenging work but rewarding because we help make corporations accountable for their fraudulent actions. I’m also the president of a nonprofit organization my brother and I started last summer. Being the president of my nonprofit organization while mentoring and speaking to and encouraging youth as well as adults who are trying to overcome a difficult past and move forward is where I get my most fulfillment. In fact, it doesn’t feel like work at all because I’m not doing it for the money but instead I’m giving back and trying to make the world a better place. My family, my friends, and some of my colleagues kept badgering me about telling my story in a book. They thought I had an interesting story especially the message of Perseverance, Forgiveness, and Overcoming. I finally bought into this idea. I had already been speaking to small groups such as churches, youth groups, schools, etc., but I accepted the challenge to reach a larger audience and started writing my book about three years ago. Once I began writing my book it became cathartic for me to reflect on my life, how much I had been through, and how far I had come. The catharsis and the idea of sharing my story with the world inspired me to keep writing even when I was tired or felt like I had writer’s block. But then I realized all I had to do was tell my story without sugarcoating any of it. It was my story and I had it all in my head already. What do you like to do when not working/writing? I enjoy spending time with my preteen daughter as much as I can before she becomes a teenager and I’m no longer cool to hang out with. She’s still a daddy’s girl. I also spend a chunk of my time volunteering with nonprofit organizations or with someone’s political campaign or community advocacy. Following politics is a passion of mine and can be an obsession at times which isn’t always healthy. There is a small possibility I may go into politics before I turn 55. If I don’t by then I probably never will. Also as I mentioned I love running. I’m an avid jogger/runner and have competed in several 5K, 8K, and half marathon races. However, my knees are starting to give out on me so I don’t do as much running as I used to. Do you like traveling or do you prefer staying indoors? I do like traveling and plan to do a lot of it in the near future but I’m also a homebody when not traveling and don’t particularly like large crowds. I do want to see the entire United States and as much of the world as I can before my time is up on this earth. Did any of your books get rejected by publishers? This is my first book and I never got far enough to be rejected by a publisher. I submitted my manuscript or portions thereof to over a dozen literary agents and no one responded. So I decided to self-publish. How does it feel when you get the recognition you deserve? I think everyone enjoys being recognized for something they put a lot of time and effort into. If you’re talking about recognition for my book, it feels great. I spent an enormous amount of time making this book project come to fruition, particularly because I wrote it myself and self-published. A lot of blood, sweat, and tears, especially considering this is my first book and I didn’t have the luxury of working with a professional co-author or ghostwriter. So when someone says to me they enjoyed my book or it was a good read, or my story inspired them, it’s a joyous feeling. I’ve had an immense amount of challenges I had to overcome in my life and in writing this book. So yes I feel good when I feel like I’m being recognized for my work whether that recognition comes from my book, speaking, completing a challenging project at the office as an attorney, or being a good father. I do! I love having the chance to share a quick anecdote of my life or snippets of my book to strangers in person prior to them reading my book. I think they become more connected to me and invested in the reading. Do you reply back to your fans personally? Absolutely. I believe being personable is something that has been lost in the age of advanced technology, mass media, and the rise of the internet and smartphones. In fact, I still send everyone in my contacts a personal Merry Christmas and Happy New Year on those days. And sometimes I still handwrite letters or notes instead of using a word processor. Rarely do I ever send a mass text unless I’m in a super rush and it’s information that has to go out immediately. Most of the time I can take ten or fifteen minutes out of the 1440 minutes in a day to send a personal text or email to those who need the information. Therefore, until I become too busy or have too many friends and fans to take the time to respond personally, I will continue to do so and that includes replying to each of my fans by name. What advice can you give young inspiring author/writers? Believe in yourself and just write even if you think you’re not good at it. As I said no literary agent believed in me and I thought I had a compelling story or at a minimum an interesting story to share with the world. Don’t get bogged down in the “I have writer’s block” mentality especially if it’s a memoir or autobiography. Just write about what you know. And don’t worry too much about spelling, grammar, or perfection until the end. The more you write the closer you’ll get to finish your manuscript and there’s always time at the end to proofread and edit. You’ll end up going through a hundred drafts anyway so don’t get bogged down with perfection in the early drafts. If you don’t write there will never be anything to proofread or edit at the end. So just began writing and keep on writing. You’ll eventually get there. If you could go back, what advice would you give your younger self? Stay in your own lane, don’t try to fit in, have the courage to walk alone, don’t allow your present circumstances define who you are and who you can become, love God and family more, and don’t be so damn serious all the time. This is not the typical feel-good story one may be used to reading in these types of motivational memoirs. It's not about some exceptional black kid from the ghetto who resisted the negative trappings of his environment and goes on to do good and makes his whole community proud. On the contrary, this is an example of someone who gave into the temptations of the streets, made some terrible choices along the way, and paid an enormous price for it. The silver lining to his story is Lamontt made the decision to turn his life around and to do so regardless of his past. 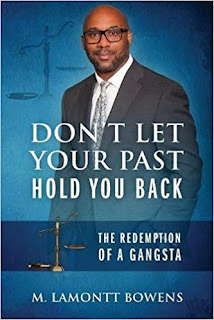 Lamontt overcame a broken family, poverty, gang violence, drugs, and prison, in order to begin his journey to become a good father, a good citizen, and ultimately an attorney. When it's all said and done, Lamontt's story is about forgiveness, determination, and perseverance. He is the quintessential example of someone who refused to allow his past to hold him back. M. Lamontt Bowens is an attorney, author, and motivational speaker. He grew up in the rough and tough streets of Southeast and East San Diego during the 1980s Crack Cocaine Epidemic. He was raised by his single parent mother and gave into the negative temptations of the streets by the time he was thirteen. 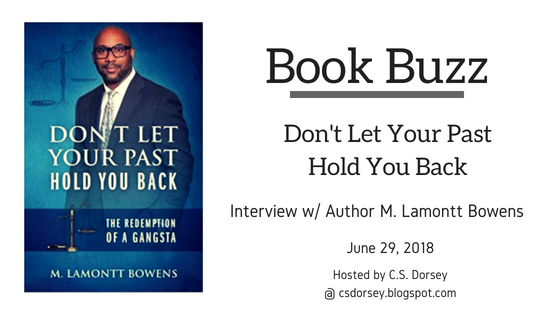 After getting involved in serious drug dealing, gang activities, dropping out of high school, and ultimately spending time in prison, Lamontt turned his life around and now shares his story of redemption and perseverance.